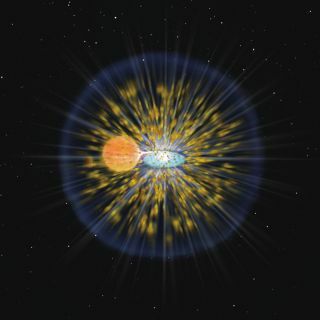 A classical nova such as Nova Delphini 2013 occurs when material flows from one star in a close binary to the surface of its companion white dwarf. An explosion on the surface of a dying star has is helping to clear up a mystery behind copious amounts of lithium seen in the universe. By studying Nova Delphini 2013 (V339 Del), astronomers were able to detect a precursor to lithium, making the first direct detection of the third lightest element whose abundance had long remained in the theoretical realm. When V339 Del was spotted by an amateur astronomer on Aug. 14, 2013, it was just beyond the limit of being visible to the naked eye, though it was visible in binoculars and telescopes. Within two days, it had brightened enough to be seen without instruments in regions without too much light pollution, the first naked-eye nova since 2007. Novae form when material from one star in a close binary surface is dumped onto the surface of its white dwarf companion. The runaway thermonuclear reaction causes the surge in brightness, which in turn creates more complex elements than the hydrogen and helium that dominate the inside of most stars. One element predicted to form in the outburst is the most abundant isotope of lithium, lithium-7 (Li-7). While most heavy elements form inside of stars and through supernovae, lithium-7 is too fragile to withstand the high temperatures found within most stellar cores. "Lithium is one of the so-called 'light elements,' together with beryllium and boron. These elements are much less abundant in the Milky Way and in the Solar System than their neighbors on the periodic table,” Margarita Hernanz, of the Institute of Space Sciences in Spain, told Space.com by email. Hernanz, who studies the late stages of stellar evolution, including explosions, was not part of the research project. "They are not formed only inside of stars like the others. Their synthesis relies on processes less efficient than nuclear reactions inside the stars." Some of the lithium in the universe formed when the universe first got started, during the Big Bang. Cosmic rays interacting with stars and interstellar matter may have formed more. But these events do not provide enough lithium to equal the amount of the element present today. In the 1950s, scientists suggested that an isotope of beryllium (Be-7) could form near the surface of the star. If the fresh Be-7 was transported to the cooler outer regions before it decayed into Li-7, the temperatures would not destroy the new element. But the difficulty in observing lithium from the ground made it a challenge to verify observationally — until now. Tajitsu and his team used Japan’s Subaru Telescope on the summit of Mauna Kea, Hawaii. Its lofty altitude, large aperture and high sensitivity allowed the team to examine the composition of the material expelled from V339 Del at four points after the explosion. During the first three epochs, they were able to identify a significant quantity of Be-7 ejected from the nova at a high velocity. By the end of their observations, however, no beryllium was visible; the team is still investigating the reason behind the complete disappearance. Continuing studies of V339 Del may help answer lingering questions such as this. Beryllium-7 has a half-life of 53 days. Every eight weeks or so, the amount of beryllium is reduced by half as it decays into lithium-7, which is even more difficult to detect. In order to observe the rapidly shifting beryllium before it transitions into lithium, scientists must observe the new nova quickly, which can create scheduling challenges with large telescopes. By studying lithium in the galaxy, scientists can understand how it evolves chemically over time. "In general, all the chemical elements play an important role in galactic evolution, because they determine the chemical composition of the galactic gas from which stars form," Hernanz said. "The study of the so-called chemical evolution of the galaxy determines how this chemical composition evolves along the history of the galaxy." Tajitsu and his team hope to repeat their observations for many other classical novae, confirming how they might contribute to the evolution of lithium in the current universe. Other than the first detection of beryllium-7, V339 Del has nothing to make it stand out from other novae. It appears to be a typical explosion on a carbon and oxygen dwarf. This means that classical novae could easily contribute a substantial amount of lithium to the galaxy. The research, along with Hernanz's accompanying News & Views article, was published online today (Feb. 18) in the journal Nature.